Help choose our new logo! BioGPS is growing in usage (over 150,000 page views in the last month!) and that popularity justifies a little professional makeover. Later this year we’ll be releasing a drastically improved user interface that will be both easier on the eyes and easier to use. 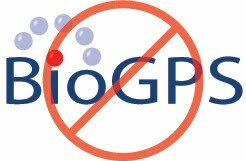 The first small step in that process is to update our BioGPS logo. We’ve enlisted the help of LogoMyWay.com in our quest for a new logo. We described what BioGPS does and the basics of what we want our logo to convey, and now designers from all over the world are competing for our prize money. The contest will run for one more week. Until then, help us choose by ranking the submitted candidates! Come back as often as you like since new designs are continuously being submitted!